Apple on Tuesday made an iPad-friendly version of its latest iOS Human Interface Guidelines reference material available to the public as a free download through the iBookstore. Covering general design and content rules, Apple's 228-page iOS Human Interface Guidelines was previously available only through the company's Developer Portal. The iBooks release was first announced by Apple senior writer Dave Addey and subsequently reported by MacStories. As seen in the image above, Apple has made an effort to translate the developer information into iPad-friendly iBooks content. Text and images are laid out in an easy to read manner that fits both portrait and landscape orientation. 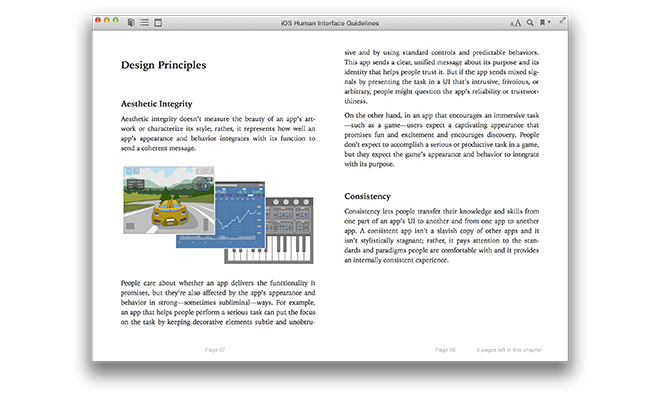 Along with the usual iBooks features like page numbers, resizable fonts and annotation support, Apple's reference guide includes embedded videos further illustrating important topics. For example, the explanation for iOS app animations is augmented with a short six-second clip. Apple's iOS Human Interface Guidelines is a free 20MB download from the iBookstore and is compatible with iOS devices running iOS 4.3.3 or later and iBooks 1.5 or later. Mac users can also access the e-book with iBooks 1.0 or later on a machine running OS X 10.9 or later.